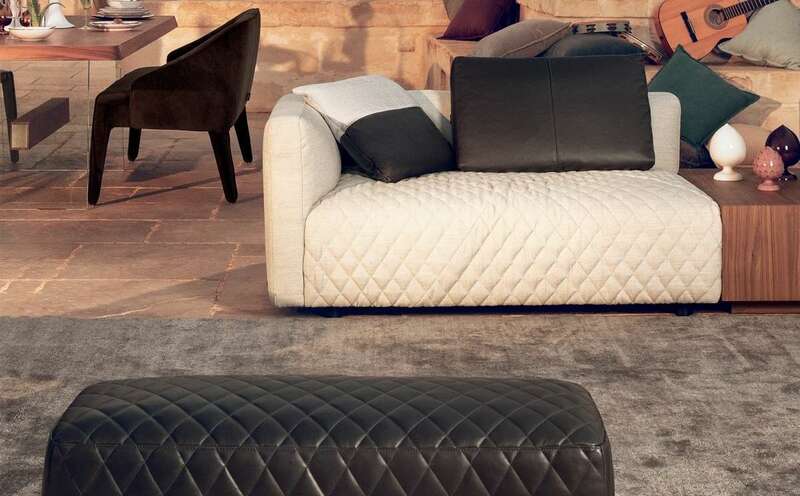 The Melpot sofa is available in a wide range of fabric and precious Natuzzi leather covers, in over 200 colours. 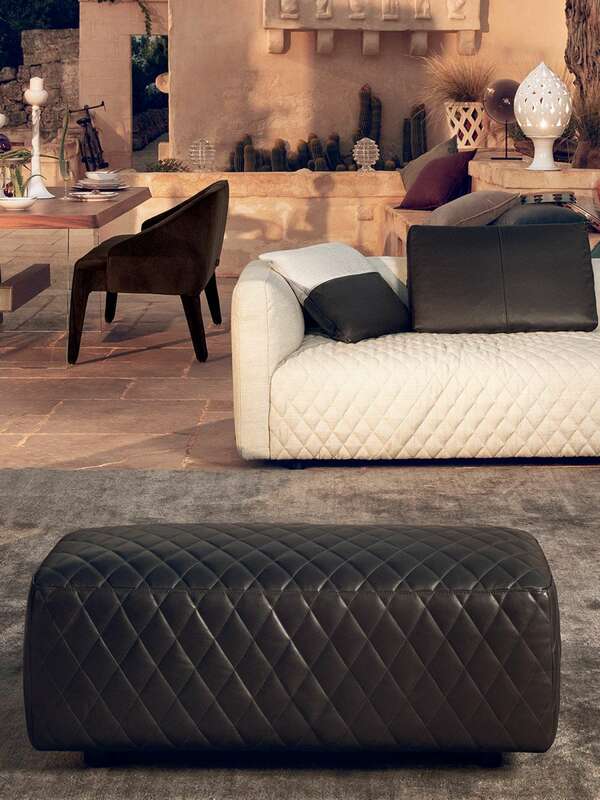 Some elements can be upholstered in quilted leather. 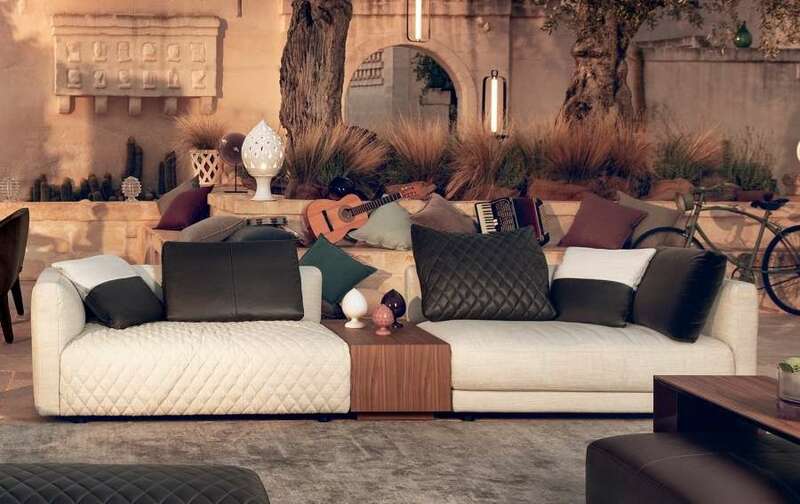 From 15 to 22 april enjoy special prices* on our made in italy collection for the living, dining and sleeping areas. 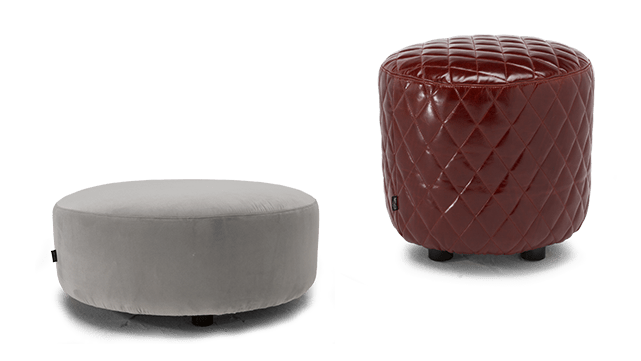 Melpot is an extremely modular and versatile furnishing system for the living area, consisting of seating elements, poufs, bookcases and shelves. Designed by Mauro Lipparini, Melpot is a solution for people who love to customize every single detail. The mini collection of cushions enhances the aesthetics and comfort of Melpot. 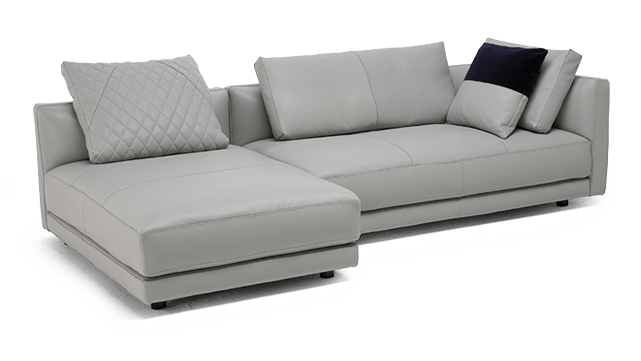 Some cushions feature a mechanism that allows you to adjust the position, achieving the desired level of comfort. The seat cushions are padded with Climalight (special latest-generation silicone microfibre). The loose cushions are filled with goose down for maximum softness. All the individual elements are interchangeable: they can be re-positioned at will and can also be used alone. The mix of fabric and precious Natuzzi leather coverings enhance every composition, making it very striking and original. 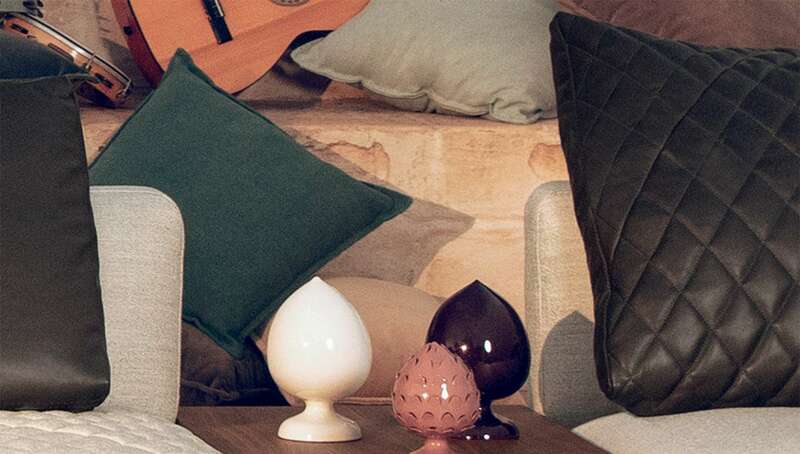 A mini collection of cushions in different colours, materials and sizes enhances the model's essential design. 80+ leathers, 130+ fabrics and countless configurations. * This offer is not cumulative with any other promotional offer. TAKE ADVANTAGE OF OUR SPECIAL OFFERS.. The methods used to manage this website are described on this page, in reference to processing of the personal data of users who consult the website. This information is provided pursuant to art. 13 of legislative decree 196/03 (hereinafter the Privacy Law) for users of the services of our website, provided via the Internet. The information does not apply to other websites consulted via our links, for which Natuzzi S.p.A. is not liable in any way. The information is also based on Recommendation no. 2/2001, which the European authorities for protection of personal data, combined in the group created by art. 29 of directive no. 95/46/CE, adopted on 17 May 2001 to identify the minimum requirements for collection of personal data on line: the methods, times and nature of the information which data controllers must provide to users when they visit the website. 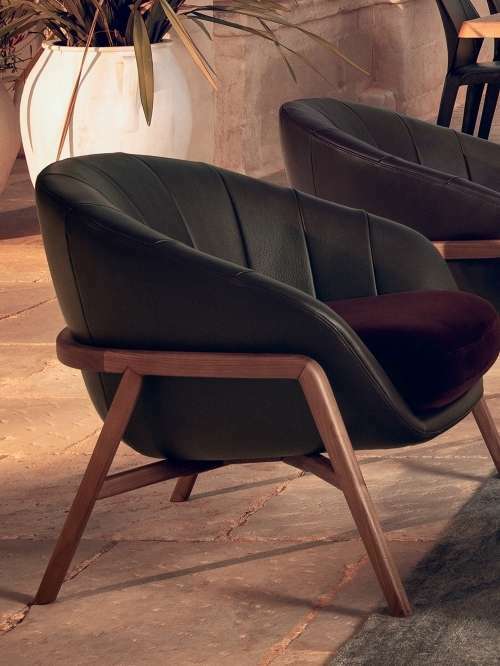 The processing connected with the services of this website is performed at the aforementioned registered office of the Company, by employees and collaborators of Natuzzi S.p.A. responsible for processing and by any other people assigned to this. The personal data provided by users submitting requests for services is used for the sole purpose of providing the service and is not disclosed to third parties, unless disclosure is required by law or is strictly necessary to fulfil the requests. The data, which will not be disclosed, may be communicated to third parties exclusively for management of the services connected with our website. The computer systems and software procedures used by this website acquire certain personal data, during normal functioning, which is transmitted implicitly through use of the Internet communication protocols. This information is not collected to be associated with identified individuals, but could, by its nature, through processing and association with data held by third parties, allow users to be identified. This data includes IP addresses and domain names of the computers used to connect to the website, the URI (Uniform Resource Identifier) addresses of the resources requested, the time of the request, the method used to submit the request to the server, the size of the file obtained in response, the digital code indicating the status of the response from the server (successful, error, etc.) and other parameters relating to the operating system and the user's computer. This data is used solely to obtain anonymous statistical information on use of the website and to check correct functioning and is deleted immediately after processing. The data could be used to check for liability in the case of possible computer crimes damaging the website. Optional, explicit and voluntary sending of e-mails to the addresses indicated on this website leads to subsequent acquisition of the sender's address, in order to respond to the requests, and also any other data contained in the e-mail. Specific summary information is progressively reported or displayed on the pages of the website dedicated to particular services on request. These cookies are needed for browsing and guarantee secure and efficient browsing of the website. Google Analytics cookies are also used solely to collect information, in aggregate form, on the number of users and how they visit the website. These are third-party cookies collected and managed anonymously to monitor and improve the services of the host website (performance cookies). If you visit a website, you receive cookies from that particular website (“proprietary”) and also from websites managed by other organisations (“third parties”). These third-party cookies relate to the “social plugins” for Facebook, Twitter, Google. They are parts of the page generated directly by those websites and included on the host page. The most common use of social plugins is sharing the contents on social networks. The presence of these plugins means cookies are transmitted to and from the websites managed by third parties. Please refer to the relative information on management of information collected by "third parties". These are persistent cookies, i.e. fragments of information which remain for longer and are stored on the hard disk of the user's computer until the cookies are deleted. “Persistent cookies” only store the fact that an unidentified visitor has browsed on the website and whether or not the visitor has accepted the summary information. The website uses other persistent cookies of third parties to monitor visits relating to the digital activities performed. The Google Remarketing cookies are used. The user may decide whether or not to accept the cookies using their own browser settings. Total or partial disabling of technical cookies could prevent use of certain functions of the website reserved to registered users. However, use of public contents is possible even when cookies are completely disabled. Other than what is specified for browsing data, the user is free to provide personal data to request the services offered by the company. It may be impossible to obtain the service requested if the data is not provided. The personal data is processed manually or automatically, for the time necessary to achieve the purpose for which it has been collected. The personal data processed is kept in a manner to reduce the risks of destruction or loss of the data, even accidental, unauthorised access or illegal processing or processing unrelated to the purposes of collection to a minimum, by adopting appropriate and preventive security measures. 1. The person concerned is entitled to obtain confirmation of whether or not their own personal data exists, even if not registered, and whether it is communicated in intelligible form. e) the parties or the categories of parties to whom the data may be communicated or who may learn it as the appointed representative in the territory of the State, managers or processors. c) certification that the operations of letters a) and b) have been explained, even only in terms of their content, to anyone to whom the data itself has been communicated or disclosed, unless this is impossible or would involve a use of resources which is manifestly disproportionate to the right being protected. b) processing of their personal data in order to send advertising or direct sales material or to conduct market surveys or make business communications.